In this day and age it’s become evident that character is being taught less than in past generations. Children used to commonly be taught from an early age the importance of character even in secular environments. In recent days however we’ve witnessed corporate scandals and presidential scandals that have been blatant examples of a lack of character and a clear example of sin. Fortunately, there’s been a resurgence of character training especially in the many Christian homes around the world, where parents are training their children in character that is grounded in the Word of God! There is hope for the generations to come as these children grow up and become a vital part of society. Now, when you hear the word courage, what is your first thought? Or, who is the first person that comes to mind? What Biblical person(s) come to mind? This word may solicit many thoughts or reactions and as a believer you know that this is a character quality that God desires you exemplify. You also should know that you will be more successful in your walk with the Lord and your life if you live with character, Biblical character. Furthermore, you will make a greater impact on this world for God if you are a person of character. -It takes courage and faith to put God first in all things. -It takes courage to stand firm in Faith. -It takes courage to stand for God and for what is right even when it’s not popular. -It takes courage to love those who hurt you. -It takes courage to speak the truth in love. -It takes courage to do what’s right, especially when no one else will. -It takes courage to forgive others. -It takes courage to not deny Christ even if it may cost you everything – even your life. -It takes courage to live by faith and reject what the outside circumstances and influences tell you. -It takes courage to do the right things in your business practices even if someone wants you to do something unethical. It takes courage to do a lot of things in life and as a Christian you are not alone because it’s God who strengthens you. We need more Christians courageously standing on the Word of God and living it out in their lives. We also need our Pastor’s courageously teaching the truth of God’s word from the pulpit, on the TV, on the radio and via the other electronic technologies such as e-Mail, and Internet broadcasting. We also need to pray that our spiritual leaders do not back down from or water down the truth because they want the approval of man. Now I’m not suggesting we stop speaking the truth in love and become hard nosed, rather, I’m saying we need to make no exceptions when it comes to the truth! This takes courage and it takes the power of the Holy Spirit to live this out. Of the many people God teaches us about in the scripture two stand out in my mind. They are King David and Peter. Look at the Life of David, he did what no one else would to and he rose to the challenge and God strengthened him and used Him to slay Goliath. He didn’t stop and say, I’m too small, I’m just a simple shepherd boy, no, others did doubt but the fact of the matter everyone else was too scared to do anything. David wasn’t! He showed great courage that day as He knew God was with Him and God made Him victorious in battle. Next, look at the life of Peter. He was the man that Jesus chose to start The Church with. Peter was passionate and seemed to talk and act before he thought sometimes, but none-the-less God used Him! Peter for the most part was a man of courage and you’ll remember the time when they were in the boat and off in the distance the disciples saw a figure out there walking on the water toward them! As you’ll recall some of them thought it was a ghost or something and Peter was the only one to stand and say, Lord if it is you call me to yourself and I’ll come to you! As much of a bad rap Peter gets from people, we have to see that he was the only one who had the courage and faith to get out of the boat and step onto the water to meet Jesus. No matter the circumstances or people around him, he stepped out because again, he had the faith and courage to see Jesus Christ before him and then go to Him. I only hope that you and I have that kind of courage because there are a lot of people, circumstances, and influences around us that can make the path ahead of us seem cloudy. Furthermore our adversary the evil one himself would like us to be uncourageous and to also be lacking in character in general. Let’s be clear, we need to pay no attention to him whatsoever because we’re here to live for God and not him! I don’t know about you but I’ve been reminded on several occasions as a follower of Christ to stay strong and courageous in faith no matter what circumstances come our way. Let me exhort you to do the same. I received one such reminder when I was going through a tough circumstance and a friend simply stated, “do not allow your current circumstances to dictate your walk!” In other words, stay strong, don’t change just because things look bleak, rather, stay strong and courageous. We need to saturate our minds and hearts with His Holy Word and as we live out our lives and see Jesus for who He is and how He’s working in our lives, (and in the lives of numerous others around the world) then courage and character will become less of a struggle. With this, we need to remember that it is God that is working these things in our lives and shaping us and molding us for service unto Him. The more we do things His way, the better, so let us be willing to allow Him to work in our lives. May we live our lives to honor Him and may we be committed to being people of Biblical Character. This is a call for every Christian, we are to be people of character! Not just any supposed character, but the character that God builds in our lives and teaches us through His Word and through the lessons He teaches us in the life He’s given us. We need to be people of courage and may The Body of Christ continue to be vigilant (through the Holy Spirit’s strength) to turn the tide and never stop teaching character. Finally, may you have the courage to speak the truth in love each time God calls you to do so! -When you hear the word courage used, what is your first thought? -Who is the first person that comes to mind? -What Biblical person(s) come to mind? -In what area of your life do you need courage? -Or, where in your life do you need the Lord’s help to have courage? -Do you think that God and others would see you as a person of courage and Biblical character? 1-Make your own list of courage: What were the times in your own life that you had to have courage? 2-Do a Bible study on people of courage in the Bible. 3-From your Bible study, select a few verses about Courage and Character and memorize them. 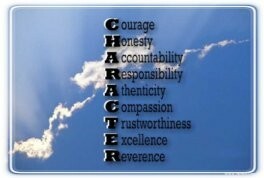 (Then review them on at least a monthly basis as a great personal tool and reminder of the importance of character. 4-Pray and ask God to help you have courage and character throughout your entire life.